Somaliland’s President Ahmed Mohamed Silanyo opened the first commercial bank in the de facto state on Sunday, 30 November 2014. The bank plans on opening offices across the region, while hoping to attract foreign lenders to Somaliland and reduce the territory’s dependence on remittances sent from diaspora communities around the world. 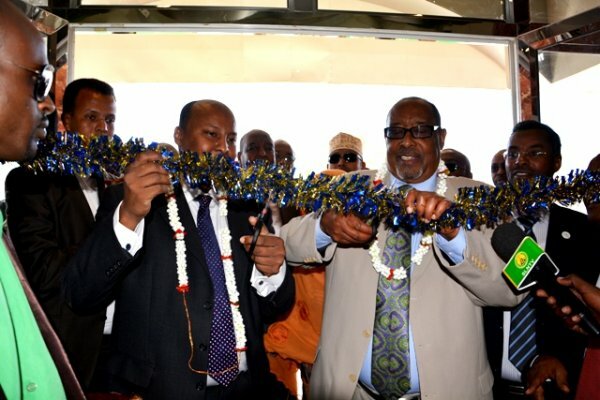 Somalia's breakaway enclave of Somaliland formally opened its first commercial bank on Sunday, 30 November 2014, as part of its effort to attract foreign lenders. President Ahmed Mohamed Silanyo officially inaugurated Dahabshil International Commercial Bank in Hargeisa, calling it a "vanguard for national development and progress". Somaliland, in the northeast of Somalia, has not been recognized internationally. In 2012, it established a central bank, looking to encourage foreign commercial banks to start operating. It has traditionally had no formal banking sector and its people rely heavily on remittances from Diaspora communities in Europe, North America and the United Arab Emirates, as there are no ATMs or loan facilities. Abdirashid Mohamed Saed, Dahabshil's manager, said the bank was officially recognized less than a year ago and had issued $70 million in loans, providing benefits to the livestock, agriculture, education, health and real state financing sectors. After the opening on Sunday, 30 November 2014, of its first actual branch, Saed said the bank plans to open offices in all the regions of Somaliland.